Payments as low as $43/mo. Or, apply & pay as little as $43/mo. 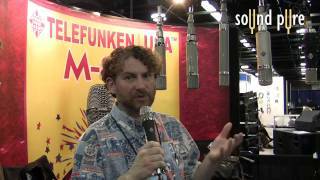 The TF51 is a fresh take on the “Austrian” microphone sound associated with the Telefunken ELA M 251E and C12. The TF51 continues this legacy, exhibiting a smooth midrange and airy top end, capturing every nuance in pleasant detail. This is a reliable first choice for stand out vocals, acoustic instruments, and percussion. Every TF51 microphone system comes with a multi pattern M 903 Power Supply, M 803 Tube Microphone Cable, ZC03 Shell Case, M 703 Shock Mount, M 782 Stand Mount, and Microphone Sleeve.